LAS VEGAS – Reigning Super Stock and Stock Eliminator world champion Justin Lamb continued his hot streak at The Strip at Las Vegas Motor Speedway collecting his 24th national event victory after defeating former world champion Jimmy DeFrank in the Super Stock final at the NHRA Toyota Nationals. Lamb lead a host of sportsman winners including David Billingsley (Competition Eliminator), Matt Blodgett (Super Gas), Chris Stephenson (Stock Eliminator), and Kevin Wright (Super Comp). Billingsley captured his fifth national event win and fourth in Comp at Vegas after he drove his Camaro to the win over the dragster of Doug Engels. After losing over .25-second of index due to the CIC penalty in the early rounds, Engels was forced to take a shot at the tree in the final. Billingsley posted a .037 reaction combined with a -.0482 under 8.268 for the win. Prior to the final round, Billingsley had not been worst than .030 at the tree which is stellar in the world of Comp Eliminator racing. Lamb was once again stellar at the tree averaging a .022 light through seven rounds of eliminations at Las Vegas. In order to collect his 24th Wally in his 35th national event final, Lamb had to beat two of the top Super Stock racers in the country in the final three rounds. In the fifth round on Saturday night, Lamb paired against professional sportsman racer Dan Fletcher for an epic clash with a bye to the final at stake for the winner. Fletcher let go .000 while Lamb trailed with a .015 light himself. At the stripe Fletcher got behind by .001 to post a .024 package while Lamb posted a dead-on 8.728 for a .023 package and the .001 win. After the semifinal bye run, Lamb paired against Jimmy DeFrank for another epic showdown. Lamb took the lead at the tree with a .011 reaction to DeFrank’s .022 and cleaned it up on the top end taking a .007-second victory when both racer’s were .02 above their dial-ins. Pete Peery was the lone semifinalist whose run ended one round short of the final when DeFrank threw down .025 total in the other lane. Appearing in his fourth national event final round Chris Stephenson finally captured his first national event Wally at The Strip. To claim the Wally, Stephenson had to take down four-time national champion Jeff Taylor in the final. Stephenson laid down .038 total in the final to lock out Taylor who’s .044 reaction was his worst of the weekend. Stephenson took .007 at the stripe after Taylor ran his dial with a one. Dwight Machael, the lone semifinalist, fell to Stephenson after going -.086 red in the sixth round. Taylor’s path to the final included a murderer’s row in rounds two through five as he faced former world champions Brad Burton, Jimmy DeFrank, and Al Corda along with Division 7 hitter Leo Glasbrenner. In making the final the hard way, Taylor proved once again why his is a multi-time world champion. With his Super Comp victory in Vegas Kevin Wright remained a perfect three for three in national event finals. Wright earned number three the easy way after Ken Mostowich was -.004 red in his Camaro in the final round. Wright posted a .013 light and a -.006 under 9.044 lap for the win. Wright was killer at the tree as he averaged a stellar .010 reaction during seven rounds of eliminations. Wright’s reaction time window was .004 to .016 which is spectacular since eliminations were spread out over three days. Wright also laid down several impressive packages over the weekend including a .017 package in round one, .018 in round two, and a .007 package in the semifinals to take out national championship contender Mark Grame. Grame made a move in the national points and is now only 33 points out of first place. With two chances left to improve two 2nd round losses, Grame has put himself in the hunt for the national championship. Another racer that’s still in the hunt for the national championship is Tom Stalba who made the trip to Vegas from the East Coast. His fifth round finish left him 62 points out of the lead but he will be replacing early losses in the final two events of the season leaving him an outside shot at the title. Matt Blodgett may consider moving to Super Gas full-time after collecting his second Super Gas Wally of the year and his third national event victory overall in his Vega. Driving one of the slower MPH cars in the class hasn’t been a problem for Blodgett as he also won the NHRA Sonoma Nationals over the summer in a car that runs Super Street more than Super Gas. To pick up win number three Blodgett used a .014 package in the final to stop Rob Willis and his Firebird. Blodgett stayed above the index in all seven rounds while nailing the index in three of those rounds including back-to-back 10.05’s in the semi’s and final round. Matt saved his best for the final as he combined a .007 light and a dead-on 10.057 to defeat Willis’s .021 initiated breakout lap of 10.042 on the 10.05 index. Willis had been strong during eliminations as he personally took down two of the contenders for the national championship. In round 5 Willis defeated Aaron Kinard after he fouled by -.001. Willis followed that up with a holeshot double-breakout victory over AAA Texas winner Casey Plaizier. For the first event since the U.S. Nationals, DragChamp failed to pick at least one winner in the sportsman classes. To see our Team DragChamp pre-event picks for Vegas, click here. 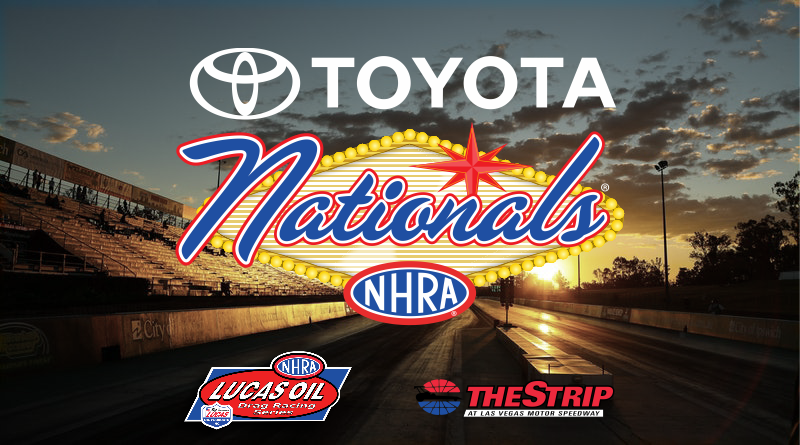 For more Lucas Oil Drag Racing Series race results from the NHRA Toyota Nationals, click here. DragChamp is your source for NHRA Lucas Oil Series drag race results. We are drag race central for NHRA sportsman class racing news and results. Visit DragChamp daily for the latest sportsman drag racing news.